After 1890, steel-frame construction and faster elevators made skyscrapers possible in the region’s cities. 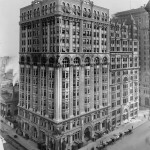 Around Philadelphia’s Penn Square and along South Broad Street, new office buildings included the Betz Building (built 1892), the Witherspoon Building (1895), the Land Title Building (1898), the West End Trust Building (1906), the Widener Building (1914), and the Atlantic Building (1923). The Betz Building, shown here in 1900, was demolished in 1926. Office building construction largely halted during the Great Depression. 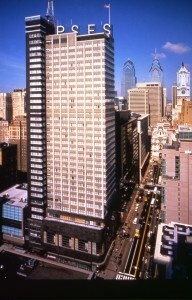 An exception was Philadelphia’s thirty-six-story PSFS Building, shown here, built in 1932 at Twelfth and Market Streets. Designed by George Howe and William Lescaze, it was the country’s first International-style tower and upon completion was regarded as the most modern office building of its time. The PSFS Building inspired skyscraper design from Mexico City to Hong Kong. Perhaps best known locally for its crowning red neon letters, “PSFS,” it was converted into a Loews Hotel in 1998 while retaining the distinctive neon letters of its earlier identity. Built at a cost of nearly $25 million over a thirty-year period starting in 1871, Philadelphia City Hall stands as a monument both to the city’s aspirations to greatness and the extravagance of its political culture. 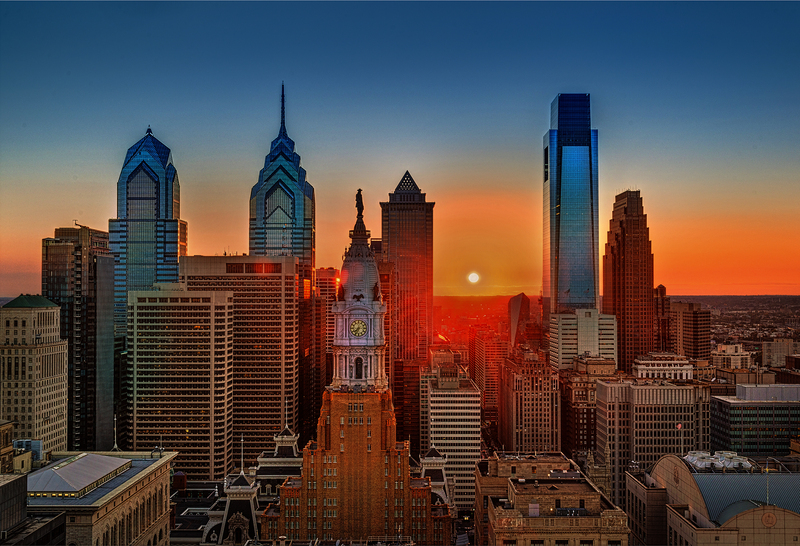 Greater Philadelphia’s office buildings reflect the aspirations of individuals, companies, and municipalities. Once clustered in cities and later spreading to suburbs throughout the metropolitan area, office buildings have mirrored changing architectural styles and economic patterns. While many celebrated office buildings have been demolished, others (new, restored, or adapted) stand as integral features of the built environment and objects of civic pride. Prior to the nineteenth century, business and professional activities occurred in an array of locations, including taverns, churches, meetinghouses, squares, or private homes. The first buildings in the Philadelphia area devoted exclusively to business appeared in the early 1800s, primarily along Chestnut and Walnut Streets from the Delaware River west to Seventh Street. Chestnut Street emerged as a banking center, predating New York’s Wall Street, while Walnut Street earned the nickname Insurance Row. Notable additions to the streetscape included the Pennsylvania Fire Insurance Co. building constructed in 1838 at 508 Walnut Street, a four-story Egyptian Revival office building designed by John Haviland (1792-1852). 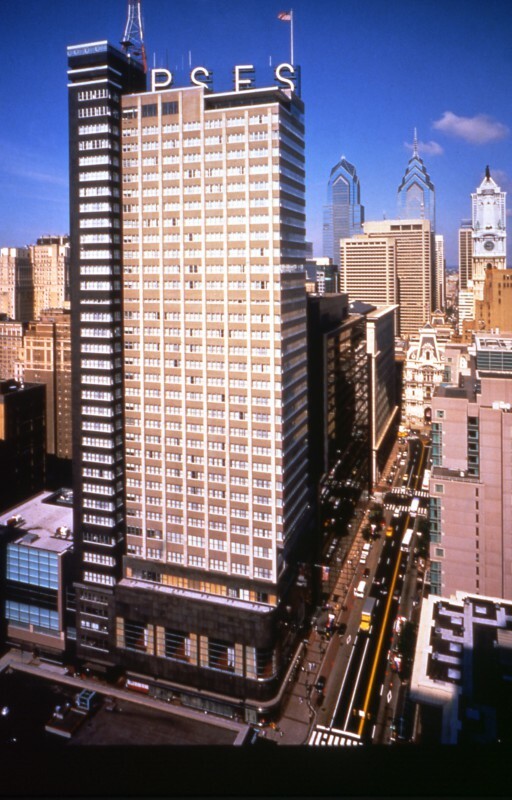 Although the building was demolished in the 1970s, its façade was incorporated into the twenty-two-story Penn Mutual Life Insurance Company office tower addition built on the same site in 1975. Philadelphia’s office buildings became larger in size in the middle decades of the nineteenth century as firms sought to communicate their wealth and power through architecture. In 1849, the ten-story Jayne Building, designed by William Johnston (1811-49), opened at 242 Chestnut Street. Soaring to a Philadelphia-record 133 feet and housing the patent medicine company of David Jayne (1799-1866), the Gothic-inspired office building was the country’s most elaborate in the pre-skyscraper era. In this time before elevators, a hoist system allowed equipment (though not workers) to reach higher floors. Other new office buildings incorporated Italianate elements, including the Lehigh Valley Railroad Building (built 1856, Willings and Third Streets); the Wilson Brothers’ Trust Company of North America building (built 1857 near Fifth and Chestnut Streets); and the Pennsylvania Company for Insurances (built 1886, 517 Chestnut Street) designed by Addison Hutton (1834-1916). As modern corporations took shape in the Gilded Age, office buildings again grew higher and more ornate. 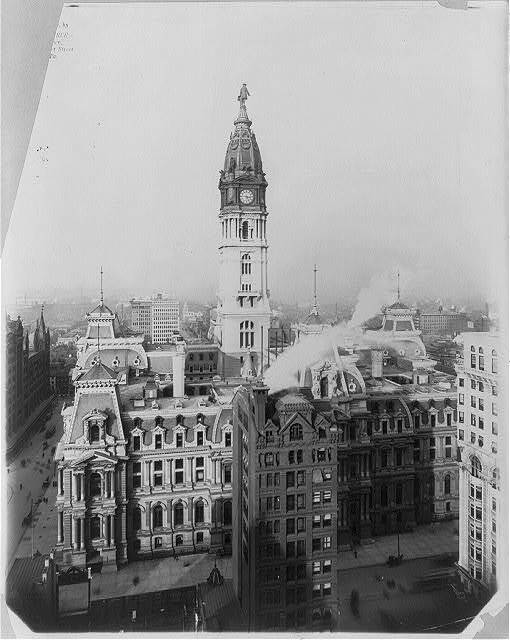 When construction began in 1871 on Philadelphia’s new City Hall on Penn (Center) Square, Philadelphia’s business district gradually moved west. The Victory Building (built 1875, 1001 Chestnut Street), designed by Henry Fernbach (1829-83) in the French Second Empire tradition, was home to Mutual Life Insurance of New York. 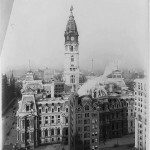 In the late 1880s, both the Philadelphia Record and the Philadelphia Times moved from the old business district close to the Delaware River into larger quarters. The Times’ Wilson Brothers-designed building (800 Chestnut) and the Record’s building, designed by Willis G. Hale (1848-1907), one block west, added new clock towers to the city’s streetscape. Reflecting the Victorian style of British architect Charles Eastlake (1836-1906), they also featured curved archways, pitched roofs, and rectangular windows. In the older business district closer to the Delaware River, meanwhile, outmoded buildings were joined by new towers, notably the Hewitt Brothers’ Gothic-like Bullitt Building (built 1886, 131 S. Fourth Street) and the sand castle-like American Life Insurance Building (built 1888, Fourth and Walnut), designed by Thomas P. Lonsdale (1855-1900). After 1890, steel-frame construction and faster elevators made skyscrapers possible in the region’s cities. Around Philadelphia’s Penn Square and along South Broad Street, new office buildings included the Betz Building (built 1892), the Witherspoon Building (1895), the Land Title Building (1898), the West End Trust Building (1898), the Widener Building (1914), and the Atlantic Building (1923). Wilmington, Delaware, then developing into a mercantile center, saw its first modern office building, the six-story Equitable Bank tower, erected in 1890 at Ninth and Market Streets. With DuPont Chemical’s growth after 1900, the Delaware-based company in 1906 erected Wilmington’s then-largest office building on Rodney Square. The twelve-story DuPont Building, also housing the Hercules and Atlas chemical companies, later included the DuPont Theater, which hosted black-tie galas and film screenings. In New Jersey, Camden’s twelve-story Wilson Building, that city’s first skyscraper, opened in 1926, the same year that the Delaware River Bridge (later renamed the Benjamin Franklin Bridge) linked the city to Philadelphia. Office building construction largely halted during the Great Depression. An exception was Philadelphia’s thirty-six-story PSFS Building, built in 1932 at Twelfth and Market Streets. Designed by George Howe (1886-1955) and William Lescaze (1896-1969), it was the country’s first International-style tower and upon completion was regarded as the most modern office building of its time. The PSFS Building inspired skyscraper design from Mexico City to Hong Kong. Perhaps best known locally for its crowning red neon letters, “PSFS,” it was converted into a Loews Hotel in 1998 while retaining the distinctive neon letters of its earlier identity. Office building construction resumed after World War II as a new generation of urban reformers and city planners including Edmund Bacon (1910-2005) sought to refashion Center City with new commercial space. In keeping with a new vision for the city advanced by the Better Philadelphia Exhibition staged in 1947 at Gimbels Department Store, a new Penn Center complex at Fifteenth and Market Streets, chiefly designed by Philadelphia architect Vincent Kling (1916-2013), was Center City’s first office project in nearly twenty-five years. Built on the site of the Broad Street Station, demolished in 1952, the complex ultimately grew to twelve buildings. Penn Center created a more modern business setting west of City Hall, but at the same time its underground connections to adjacent Suburban Station and self-contained dining, retail, and other services for office workers drained activity from streets and sidewalks. In Old City, meanwhile, the creation of Independence Mall and Independence National Historical Park in the 1950s and 1960s led to demolition of many older but distinctive buildings, including the Provident Life and Trust Building designed by Frank Furness (1839-1912), built in 1890 at 409 Chestnut Street, and the Drexel Building (built 1885, Fifth and Chestnut). In the 1970s, “Brutalist” architecture (unadorned, exposed concrete construction) characterized new construction of “Class A” office space (newest and highest quality) in Philadelphia and Wilmington. 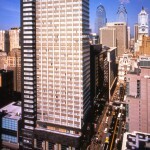 In Philadelphia, 1700 Market Street (1968), One Meridian Plaza (1972), and Centre Square (1973) rose south and west of City Hall. One Meridian stood only until 1999, when it was demolished following a deadly fire in 1991. In Wilmington, the twenty-two-story Wilmington Tower designed by I.M. Pei (b. 1917) and built in 1971 at 1105 Market Street, was city’s tallest office building until the addition of the Chase Manhattan Centre (1201 Market Street) in 1988. Beginning in the 1980s, new office towers sheathed in glass departed from mid-century tastes and buildings reached ever larger heights and footprints. The 680,000-square-foot, fourteen-story Hercules Building, Delaware’s largest office building of the decade, opened in 1983 at the edge of the residential Midtown-Brandywine neighborhood, viewed by some Wilmingtonians as a controversial setting for such a “big glass box.” In Philadelphia, Rouse and Associates’ Liberty Place, built in 1987 at Sixteenth and Chestnut Streets, broke the longstanding “gentlemen’s agreement” that no structure should stand taller than the brim of the hat on the statue of William Penn atop City Hall. Despite controversy over the breaking of tradition, a new high-rise office corridor subsequently developed along or near west Market Street in the vicinity of Liberty Place. By the mid-1990s these new towers included Commerce Square (1987 and 1992), Mellon Bank Center (1990), Two Liberty Place (1990), and the Bell Atlantic Tower (1991). They were topped yet again after Comcast, one of the nation’s largest cable providers, broke ground in 2005 for a headquarters designed by Robert A.M. Stern (b. 1939). 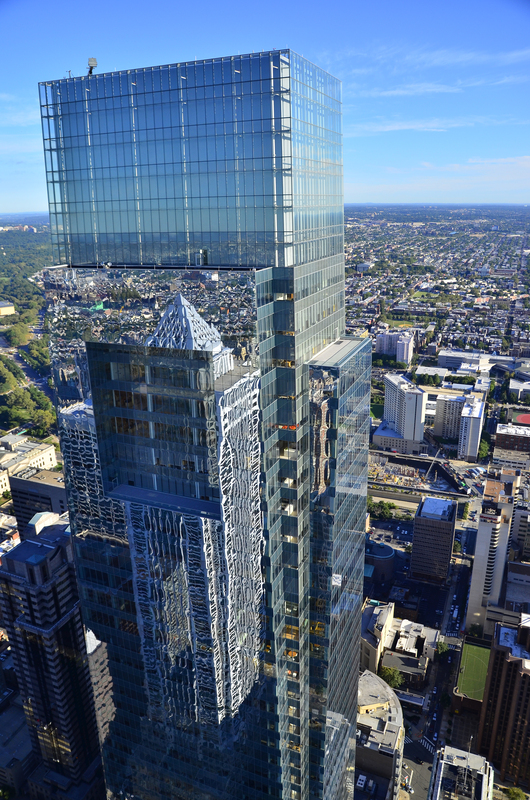 The fifty-eight-story Comcast Center became the city’s tallest building when it opened in 2008, but was to be surpassed in 2016 by a second Comcast office tower under construction at Eighteenth and Arch Streets. In the early 2000s, adaptive reuse and the redevelopment of former industrial land brought new office space to the region, including Wilmington’s Justison Landing (leased by MBNA Financial, ING Direct, and Barclays Bank) and the Philadelphia Navy Yard (leased by Urban Outfitters and Tastykake). Moreover, as millennial workers repopulated one-time working-class neighborhoods, adaptive reuse and green technologies allowed tech start-ups, film producers, and public relations firms to lease new office space in buildings such as South Kensington’s Oxford Mills dye works and the Schmidt’s brewery in Northern Liberties. At the same time, some older office buildings in Center City that had outlived their appeal to commercial tenants gained new life as residential apartments and condominiums. New plans also emerged to counteract the “canyon effect” of skyscrapers near and along west Market Street and allow more engagement with streets and sidewalks. In April 2015, Philadelphia-based DAS Architects planned a new three-story façade for the office tower at 1700 Market Street, including floor-to-ceiling windows and a roof deck open to the public. Since the early nineteenth century Greater Philadelphia’s office buildings, adapting to economic needs, architectural tastes, and geographic changes, exemplified the relationship between people and commerce. While many of the region’s older examples survived into the twenty-first century through historic preservation and adaptive reuse, new office buildings continued to rise throughout the metropolitan area. Gallery, John. 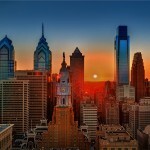 Philadelphia Architecture: A Guide to the City. Philadelphia: Foundation for Architecture, 1994. Keels, Thomas. Forgotten Philadelphia: Lost Architecture of the Quaker City. Philadelphia: Temple University Press, 2007. Longstreth, Richard. The Buildings of Main Street: A Guide to American Commercial Architecture. New York: Altamira Press, 2000. Maynard, W. Barksdale. Buildings of Delaware. Charlottesville, Va.: University of Virginia Press, 2008. Mozingo, Louise A. Pastoral Capitalism: a History of Suburban Corporate Landscapes. Cambridge, Mass. : MIT Press, 2011. Saval, Nikil. Cubed: A Secret History of the Workplace. New York: Doubleday, 2014. Thomas, George E., et. al. Buildings of Pennsylvania: Philadelphia and Eastern Pennsylvania. Charlottesville, Va. : University of Virginia Press, 2010. Wright, Robert E. The First Wall Street: Chestnut Street, Philadelphia, and the Birth of American Finance. Chicago: University of Chicago Press, 2005. Office Buildings: multiple collections and holdings, Historical Society of Pennsylvania, 1300 Locust Street, Philadelphia. Office Buildings: collection and images, Urban Archives, Special Collections Research Center of Temple University Libraries, Samuel L. Paley Library, 1210 Polett Walk, Philadelphia. PSFS Tower/ Loews Hotel, 1200 Market Street, Philadelphia. 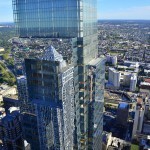 Comcast Center, 1701 JFK Boulevard, Philadelphia. Great Valley Corporate Center, Malvern, Pa.
Du Pont Building, 1007 N. Market Street, Wilmington, Del. Wilson Building, Cooper Street and Broadway, Camden, N.J. 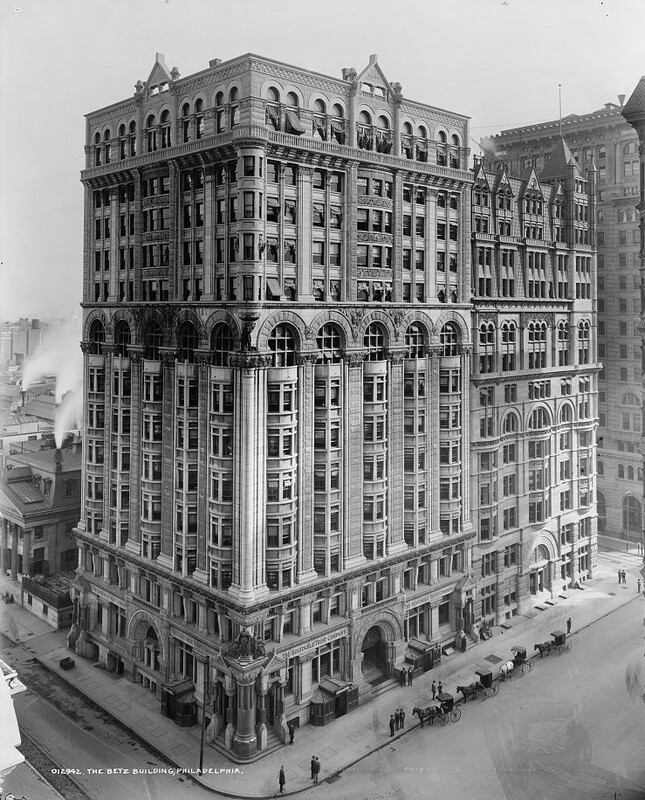 This misses the critical story of the invention of the modern steel frame building – in Philadelphia, by the Wilson Brothers Co. First at Broad Street Station, then Drexel Building, then Professional Building. Wilson, reviewing Edward Shankland’s book on Chicago construction remarked that he had done all of these things 10 years earlier in Philadelphia.